Each $58 box contains 24 packs. Each pack contains 5 cards. Every True Blood Archives box includes 2 Autograph cards and 1 Relic card! Signers include Anna Paquin, Ryan Kwanten, Alexander Skarsgard, Rutina Wesley, Denis O'Hare, Janin Gavankar, Kristin Bauer, Chris Bauer, Valentina Cervi, Mehcad Brooks, J. Smith-Cameron, James Frain, William Sanderson, Jim Parrack, Nelsan Ellis, and many more! 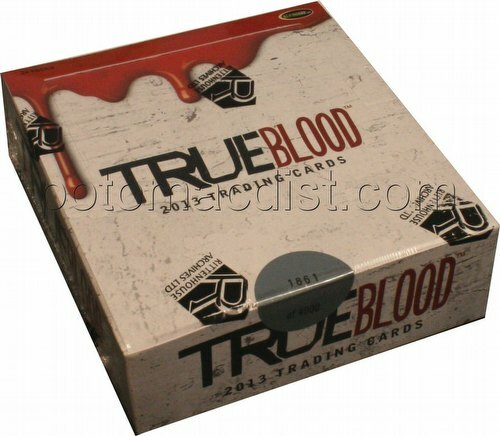 Relic cards include materials connected to Sookie, Eric, Pam, Russell, Lorena, Arlene, Jessica, Merlotte's Bar, Tru Blood bottles, and more! The 72-card base set features bios for 48 different characters and plot synopses for all 12 Season Five episodes. Bonus sets include a 72-card parallel base set (1:3 packs), an 18-card Romance set (1:8), a 9-card Quotable set (1:12), and an 11-card Gallery (Clear Plastic) Character set (1:24). The case topper is a True Blood Preview card. Case incentives include a 3-case Deborah Ann Woll (Jessica) Autograph card, a 6-case Stephen Moyer (Bill) Silver Signature Series Autograph card, and an 18-case Archive box.